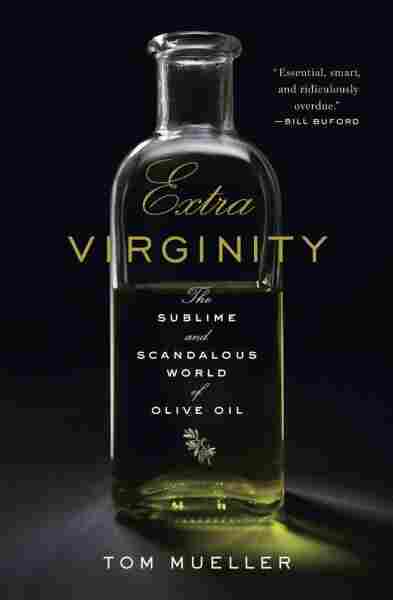 Losing 'Virginity': Olive Oil's 'Scandalous' Fraud In his book Extra Virginity, Tom Mueller explains why you can't believe everything you read on olive oil labels. Much of the "extra-virgin" olive oil sold in the U.S. has actually been mixed with lower-priced, lower-grade oils and artificial coloring, he says. Extra-virgin olive oil is a ubiquitous ingredient in Italian recipes, religious rituals and beauty products. But many of the bottles labeled "extra-virgin olive oil" on supermarket shelves have been adulterated and shouldn't be classified as extra-virgin, says New Yorker contributor Tom Mueller. The term "extra-virgin olive oil" means the olive oil has been made from crushed olives and is not refined in any way by chemical solvents or high heat. "The legal definition simply says it has to pass certain chemical tests, and in a sensory way it has to taste and smell vaguely of fresh olives, because it's a fruit, and have no faults," he tells Fresh Air's Terry Gross. "But many of the extra-virgin olive oils on our shelves today in America don't clear [the legal definition]." Extra-virgin olive oil wasn't created until stainless steel milling techniques were introduced in the 1960s and '70s. The technology allowed people to make much more refined olive oil. "In the past, the technology that had been used had been used really by the Romans," says Mueller. "You grounded the olives with stone mills [and] you crushed them with presses." The introduction of stainless steel milling techniques has allowed manufacturers to make more complex and flavorful extra-virgin olive oils, he says. But the process is also incredibly expensive — it costs a lot to properly store and mill extra-virgin olive oil. Mueller says that's why some people blend extra-virgin olive oil with lower-grade, lower-priced products. "Naturally the honest people are getting terribly undercut," he says. "There's a huge unfair advantage in favor of the bad stuff. At the same time, consumers are being defrauded of the health and culinary benefits of great olive oil." Bad or rancid olive oil loses the antioxidant and anti-inflammatory properties of olive oil, says Mueller. "What [good olive oil] gets you from a health perspective is a cocktail of 200+ highly beneficial ingredients that explain why olive oil has been the heart of the Mediterranean diet," he says. "Bad olives have free radicals and impurities, and then you've lost that wonderful cocktail ... that you get from fresh fruit, from real extra-virgin olive oil." "A lot of those oils have been packed in Italy or have been transited through Italy just long enough to get the Italian flag on them. That's not, strictly speaking, illegal — but I find it a legal fraud, if you will." "Extra light is just as caloric as any other oil — 120 calories per tablespoon, but the average person looking at it might say, 'Oh, well, I've heard olive oil is a fat, so I will try extra light olive oil.' ... It's highly, highly refined. It has almost no flavor and no color. And it is, in fact, extra-light in the technical sense of being clear." "From a health point of view, olive oil is wonderful [for frying]. From a taste point of view, there are times when at really, really high temperatures, an extra-virgin with really bitter flavors and pungency can become a little unbalanced. And the bitterness can become overbearing. And obviously, from an economic point of view, if you're spending a lot of money for an extra-virgin, maybe high-heat cooking in some circumstances really isn't the best thing. But for lower heat, every extra-virgin olive oil is good — it really depends on the dish you're putting together." "Get a bottle of really, really powerful, bitter and pungent oil, and pour it over some really good ice cream. And it is like an injection of liquid sunshine. It's quite a treat."